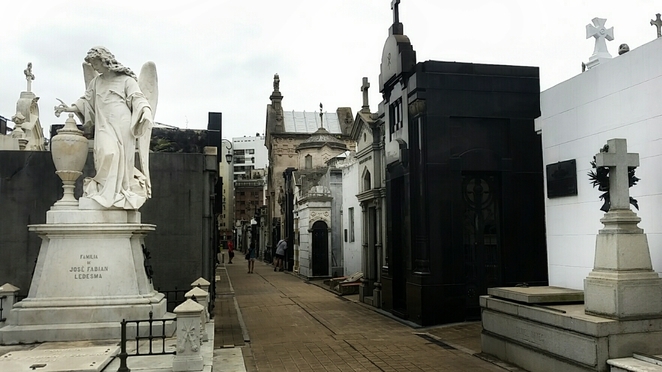 One of the many tomb lined streets of Recoleta Cemetery. Approaching the Cemetery of Recoleta all one can see is its high walls and glimpses of crosses or statues peeking over imposing high walls. The towering spires of the church, Our Lady of Pilar, (Iglesia de Nuestra Señora del Pilar, 1732), are visible from a variety of directions. Tourists flock to this well-known attraction and it can be crowded during holidays and weekends. Some mausoleums have been time ravaged, other are artworks. 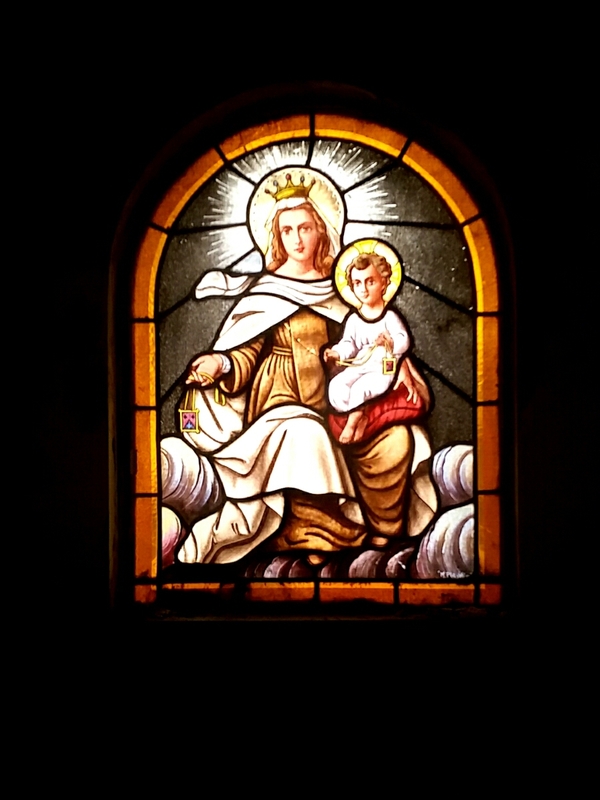 This is rated as one of the most impressive cemeteries in the world and a must see in Buenos Aires. 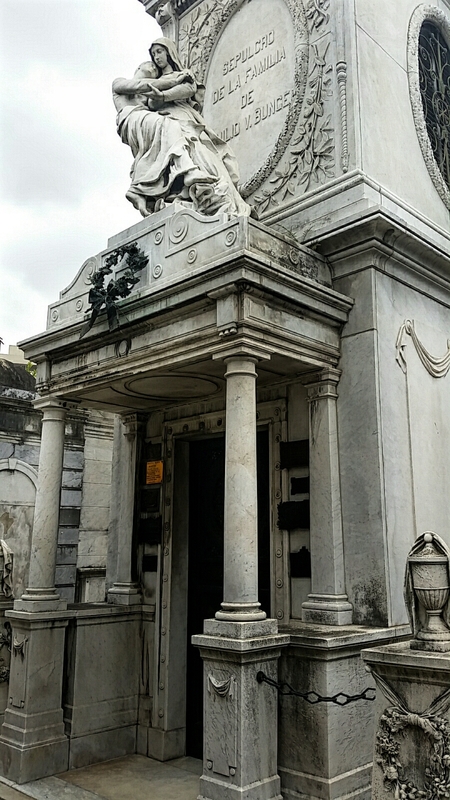 The cemetery contains 4691 vaults and an impressive list of Argentina's movers and shakers have found their final resting places within the grounds. 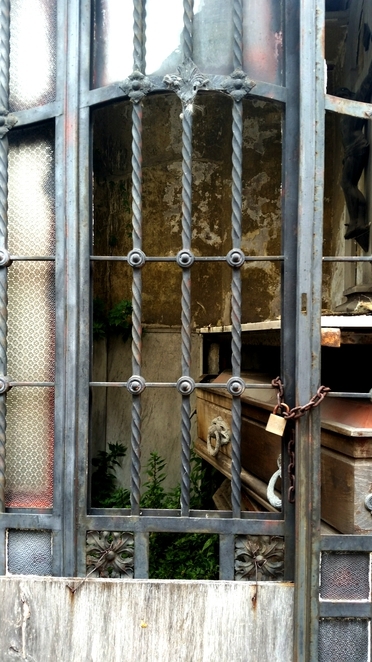 Many of the mausoleums are still used by the influential families of Argentina, while others sport fallen coffins and broken windows. It is laid out in a city like structure with marble above ground mausoleums lining its streets. Entry is through a tall, columned gate that brings you into the sombre streets dedicated to the dead. While wandering the narrow avenues it is possible to see a plethora of different architectural styles in all states of repair. Architecture ranges from Art Deco, Art Nouveau Baroque, and Neo-Gothic. Many are made of marble and contain statues and stained glass windows. Interred within the grounds are presidents, politicians, military officers, writers, poets, and Nobel prize winners. The most notable of all perhaps, is Eva Perón. Evita, as she is affectionately called, is best known as an actress and First Lady of Argentina. 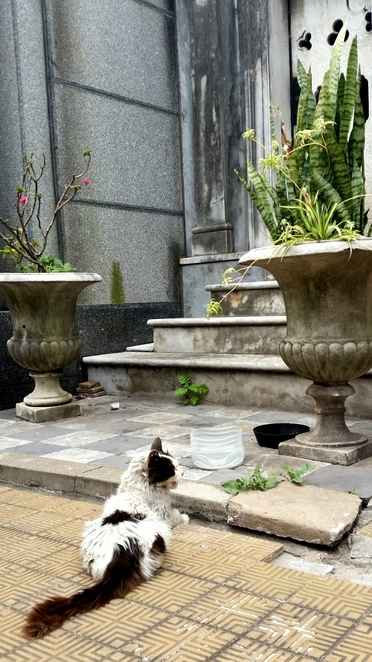 Other more active residents of Recoleta Cemetery are a variety of cats. A dedicated group of volunteers provides food and medical attention to the many cats residing within the grounds. One of the many resident cats..